Peopletrail – a leading background check and employment screening company – announced today that it will attend the 2016 Oracle HCM Users Group (OHUG) convention, June 6-9, 2016 in New Orleans, LA. Peopletrail has validated integration with Oracle’s Taleo Enterprise Cloud service and will be meeting with many of its customers and other users of Oracle’s systems to discuss the importance of selecting an accredited and trusted provider for a company’s background and screening service needs. In addition to the Oracle validated integration, Peopletrail is accredited with the NAPBS. Less than 1% of all Consumer Reporting Agencies (CRA’s) have both NAPBS accreditation and Oracle validated integration. Peopletrail announced today it will be attending the Oracle HCM Users Group (OHUG) convention, June 6-9, 2016 in New Orleans, LA. The Company will feature at the conference its fully accredited Actionable Insight Screening(TM) services for employment screening, criminal background checks, and corporate security solutions. “ We’re thrilled with the customers who have come on board with Peopletrail since our validated integration with Oracle’s Taleo Enterprise Cloud service nearly two years ago. We’re excited for the networking that OHUG provides and the opportunity we have to discuss the added value that customers receive when selecting Peopletrail as their background check and screening provider,” stated Wallace T. Davis, President and CEO of Peopletrail. Peopletrail’s integration with Oracle provides Oracle Taleo Enterprise Cloud service customers the ability to select Peopletrail as their employment-screening partner directly through Oracle Taleo Enterprise Cloud. In addition to the Oracle validated integration, Peopletrail is accredited with the NAPBS. Less than 1% of all Consumer Reporting Agencies (CRA’s) have both NAPBS accreditation and Oracle validated integration. 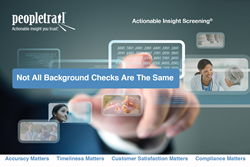 Peopletrail will be building upon its national awareness campaign “Not All Background Checks Are The Same” and the importance of accuracy, compliance, timeliness and customer satisfaction when selecting a screening provider. Mr. Davis will be presenting “Best Practices in Background Screening” to attendees on June 6th for the Customer Connections section of the event. Attendees can visit Peopletrail at booth #206 to learn more and receive one of four instant prizes given to attendees throughout the event. There will also be daily prize drawings at the booth and entry into a grand prize drawing at the closing of the event.